Samsung HT-C6200 review | What Hi-Fi? It's said a smile goes a long way. Well, in the case of AV kit, the equivalent might just be a gloss-black finish – it's hard not to feel you're getting more for your money when you unbox a system like this. Nevertheless, that takes you only so far; fortunately there's plenty of substance to this stylish Samsung HT-C6200. Uniquely in this system, you'll find two HDMI inputs alongside the output, allowing you to connect other kit such as games consoles. You'll also find an ethernet connection which, when connected to your home network, gives access to Samsung's internet@TV service – so you can use the likes of YouTube, Picasa and Twitter directly on your telly. HD audio decoding is present and correct too, while there's also support for 1080p/24fps HD video and upscaling for DVDs. A standalone iPod dock connects to the rear of the unit and gives you full on-screen control of your music. Getting to know the system is easy enough, thanks to a colourful interface adorned with large icons, and you'll find a set-up system that gives you a test tone and lets you adjust individual speaker volume. 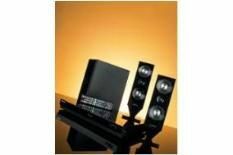 Listening first to music, the decent-sized speakers and sub deliver a large but detailed sound. There's substance and weight to Drake's Karaoke, while vocals have immediacy and insight. It's more of the same when switching to movies. Treble frequencies err on the thick side, so there's no sign of harshness, but it's a big, bold and powerful sound with good dynamics for such a relatively compact system. Focusing on the picture, Green Zone provides a tricky test of motion with which the Samsung copes admirably, while there's good attention to detail, a vivid, full colour palette and solid, true black levels. Far from just a pretty face, the Samsung backs up its sleek, smart appearance with features and performance to match. Now that's something worth smiling about.